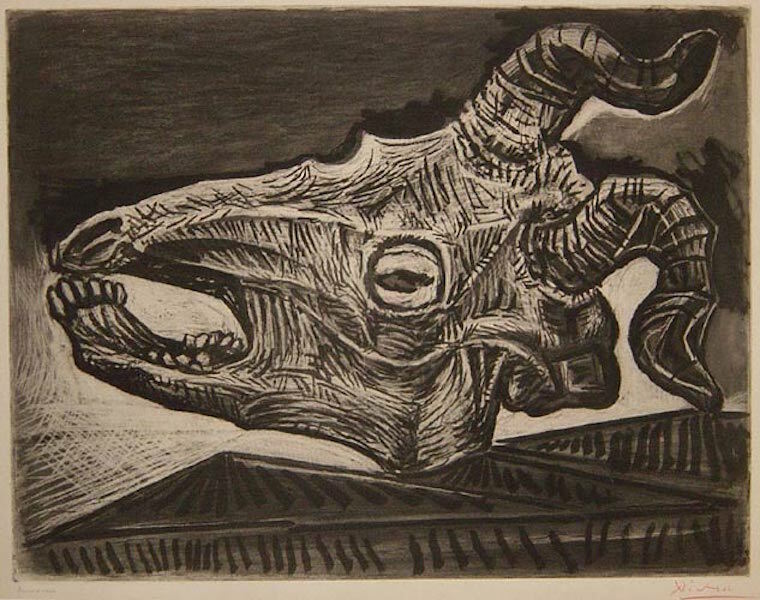 Pablo Picasso experimented with linoleum cuts by gouging a sheet of aluminum fused to a wood block. This technique of cutting out images became efficient as compared to wood block cutting. The images produced were bold, simple, and a predecessor to Cubism in form and composition. Picasso was a Spanish painter, sculptor, printmaker, ceramicist, and stage designer who spent most of his adult life in France. One of the greatest and most influential artists of the 20th century, he is widely known for co-founding the Cubist movement, the invention of constructed sculpture, the co-invention of collage, and for the wide variety of styles that he helped develop and explore. In 1900, Pablo Picasso’s first exhibition took place in Barcelona, and in the fall of the same year he visited Paris for the first time. It was in Paris where he observed the paintings of Edouard Manet, Gustave Courbet, and Henri Toulouse-Lautrec. He settled there in April 1904, and soon his circle of friends included the poet Guillaume Apollinaire, writer Max Jacob, Gertrude and Leo Stein, and art dealers Ambroise Vollard and Berthe Weill. Picasso’s visual style and choice of subject matter developed dramatically over a short period of time. The time between 1901 and 1904 has come be known as his ‘Blue Period,’ 1905 his ‘Rose Period,’ from 1908 to 1911 his Analytic Cubist phase, and from 1912 forward his Synthetic Cubist phase. The Blue Period is named for Picasso’s color palette at the time, and is distinguished by its subject matter: vagrants, outcasts, prostitutes, and otherwise marginalized people. The Rose Period marked a brightening of Picasso’s palette: pinks, beiges, roses, and light blues. His choice of subject matter followed suit: clowns, harlequins, and saltimbanques (‘circus people’). Picasso’s name is synonymous with the development of Cubism, which is the permutation of several artistic trends and of the styles of certain artists. Through Gertrude and Leo Stein, Picasso knew Henri Matisse, who had stirred audiences in 1905 with paintings displaying harsh, dissonant colors. Critics chided Matisse’s paintings, while Picasso admired them. He also admired the so-called ‘primitive’ works of Henri Rousseau. While in Paris, Picasso frequented the Musée d’Ethnographie du Trocadéro, where he saw works of indigenous African art, and in Spain discovered ancient Iberian sculpture. Through a collaboration with the artist Georges Braque, Picasso gradually combined his influences into a wholly original style, which fragmented three-dimensional forms into abstract geometric shapes that intertwined and overlapped each other. His first major Cubist work was the renowned Les Demoiselles d’Avignon, which he completed in 1907 but didn’t not show to anyone until 1916. By 1936, the Spanish Civil War affected Pablo Picasso immensely, and the following year he completed Guernica, which depicts the bombing of the Spanish city of the same name. Picasso’s association with the Communist Party began in 1944, and in the latter half of the decade he lived in the southern France. Among the large number of Picasso exhibitions that were held during the artist’s lifetime, those at Museum of Modern Art in New York in 1939 and at the Musée des Arts Décoratifs in Paris in 1955 were the most significant. In 1961, the artist married Jacqueline Roque, and they moved to the town of Mougins. He continued to work in painting, drawing, prints, ceramics, and until his death.